A dropdown menu will appear where employees can select to view a Score Card and see entries dating back 30 days. 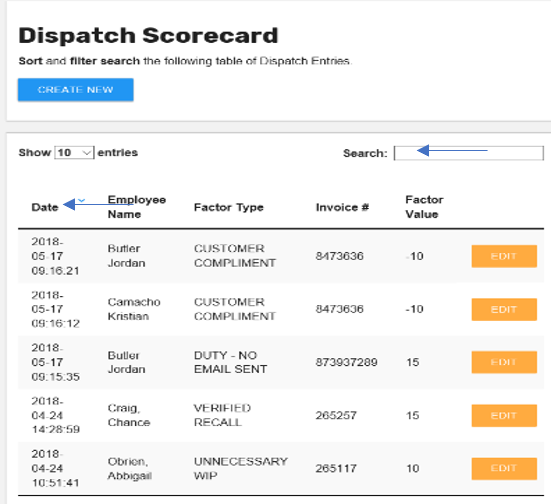 From there the employee can sort the ScoreCard by column. This includes sorting by date, employee name or factor type. Sort by clicking on the name at the top in which they would like to sort by. There is also a search bar at the top of the page to search for specific employees, factors, dates or factor values. Factors can also be edited from the recent ScoreCard if the user has permission by selecting “EDIT” on the far right of the entry. To view entries beyond 30 days a date range filter is in the “ScoreBoard” and “FactorBoard” pages.